Do you want to play games on Android using a computer? 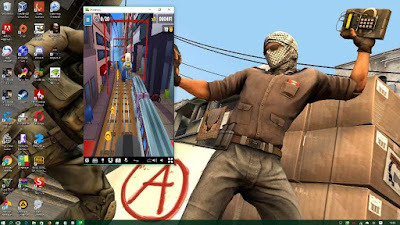 Here is how to play android games on PC which may help you. Many new Android-based games have sprung up, but to play them requires the support of mobile hardware with certain standards. Not infrequently some mobile gaming fans have to give up when faced with the condition. However, you don’t need not worry. If you are a mobile game lover but do not have the support of a qualified phone, you can take advantage of a laptop or personal computer (PC) owned. To play Android games on PC, you only needs to install Android emulator on PC device. The problem is what Android emulator which is suitable for playing Android games on PC? There are many Android emulator apps that can be used to play Android games on PC. This time, we will review one of the Android emulators are qualified enough to be used to play Android games. The emulators are called NOX Player and Koplayer. Here are 2 best android game emulator for PC. Nox Player is one of the Android emulators that has a complete utility that can be used by Android game lovers to play their favorite games. Many mobile game enthusiasts are satisfied using this Android emulator. This emulator offers keyboard, mouse and game pad support. NOX Player offers fast and light performance, based on Android 4.4.2 technology, and offers compatibility with AMD / x86. To use it, we must first download it through PlayStore. After that install like the following steps: first, double click on the Installer. Second, click YES if the permission box appears. Then, thick the agreement and choose install. Wait till the process is done and click start. Wait again for the booting process and choose next. It is done and ready to use. Koplayer can run an Android operating system directly on your computer or laptop without experiencing slowness. Unlike BlueStacks that consume considerable RAM, Koplayer has the same features but does not take up much of your computer's RAM. It certainly will make Koplayer can run smoothly while playing Android games with the best graphics though. Koplayer is an Android emulator for Desktop that can run on Windows operating system without requiring big RAM. The features of Android Emulator on PC Koplayer include: support multiple accounts, video recording, gamepad & keyboard and already have Google Play Store, and almost all applications and games can run on Koplayer. You can follow the instruction below to use this emulator. The first step is downloading Koplayer and place it where it's easy to find. The second, open the downloaded Koplayer and install it as usual. Then, choose a storage area, try the remaining large. Because the more you install the app or game, the data will get bigger. The next step is just clicking “Launch”. You can click “Next” to learn how to use Koplayer easily. You can even add your Google account first by choosing “Play Store”. After choosing the game you really wanted, here you can start to play your favorite games. In addition, you can play many more games at once time. You just add the emulator by clicking “Add Emulator”. So, this is how to play Android game on PC using NOX Player and Koplayer application. Gadgets can customize settings by clicking the Gear icon on the top of the emulator at run. You basically cannot install the android game directly through your PC since the emulator is required in this case. You are recommended to try one of these emulator for installing your favorite android games. Hope you will like it and have a good playing game time! 0 Response to "How To Play Android Games On PC using Emulator"